FOFS Board of Directors Meeting Wednesday April 10th 7:00 PM at Freeman Station, all welcome. We Need More Steam-let’s get the station on track! You may have seen the January 15 2019 Hamilton Spec Newspaper front page featuring the Freeman Station. A terrific article to get our message out, and we thank Jeff Mahoney for that. Now we really need your help in 2019 to gather the last bit of funding to reach our goals. Can you help us by becoming a member. 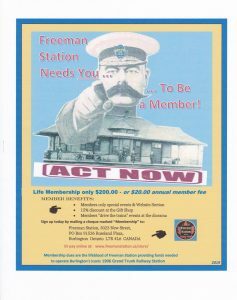 As Lord Kitchener would have said, “Please visit our website at www.freemanstation.ca/store/ ” and become a member. Prefer to come in person? The Station will be open on February 16 2019 from 10:00 am – 1:00 pm where we invite everyone to drop by. Couple of Sponsoring Ideas to Consider. 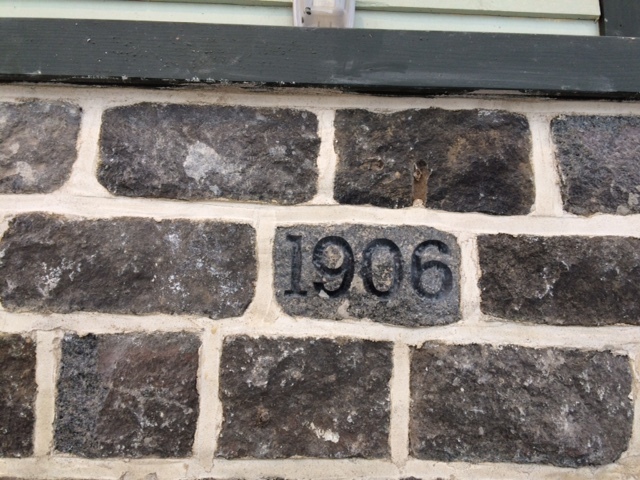 …And they will all add much needed funds for the continuing restoration of Burlington’s historic Freeman Station. Just mail a cheque to Friends of Freeman Station, PO Box 91536, Roseland Plaza, Burlington. ON, L7R 4L6; or click on the “Donate” link in the header. 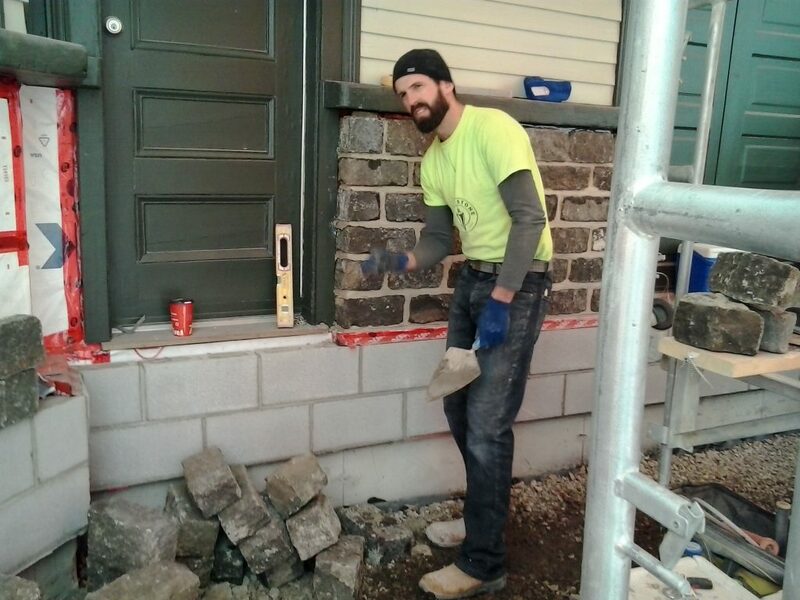 To date, more than 6,000 hours of volunteer labour have gone into the project, and more than $ 390,000 in cash and corporate/ private donations and pledges has been raised. 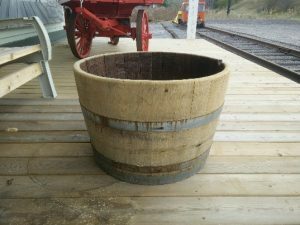 On the Station’s Lower Level, we’re planning to install a computer-driven, museum-quality interactive diorama depicting life in the hamlet of Freeman, which is now part of Burlington, in the early Twentieth Century. 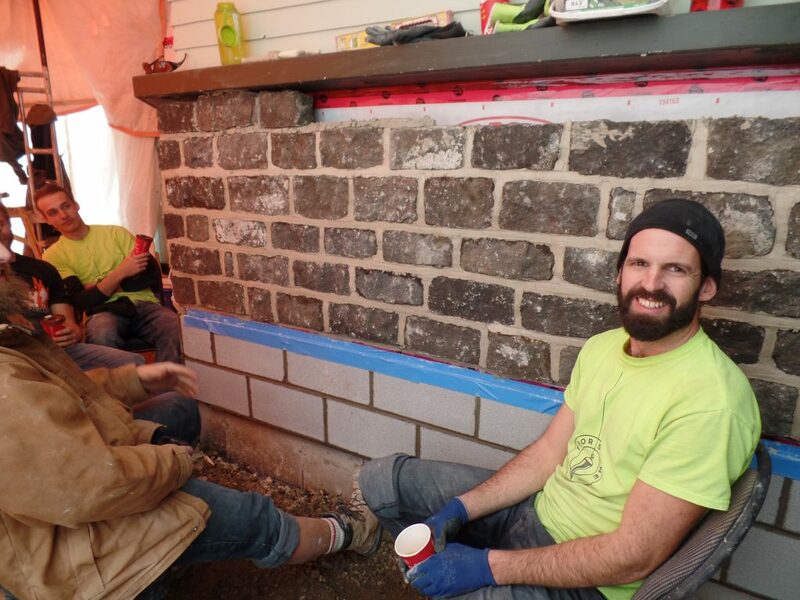 We’re looking for volunteers to join the building restoration project and/or the diorama construction project. Depending on your interests, there are many opportunities for you to get involved in this historic legacy. To any extent that you can help, please email us — info@freemanstation.ca — and let us know your interest. We’ve been working with local families to capture their stories about life in the village of Freeman and early Burlington. The first of these are now published under the “Families of Freeman/Stories” link above (or click here) and include “A.D. McMillan, Fruit and Vegetable Grower,” “Memories of Freeman,” “The Freeman Family and the village of Freeman,” “The Smith Family (Smith’s Funeral Home),” and the life story of “Theo Bullock.” There are many more family histories and anecdotes which could be added to this collection, and we’d very much like to hear from you, to add your family’s memories. Just drop us a note to info@freemanstation.ca and we’ll work out the details. 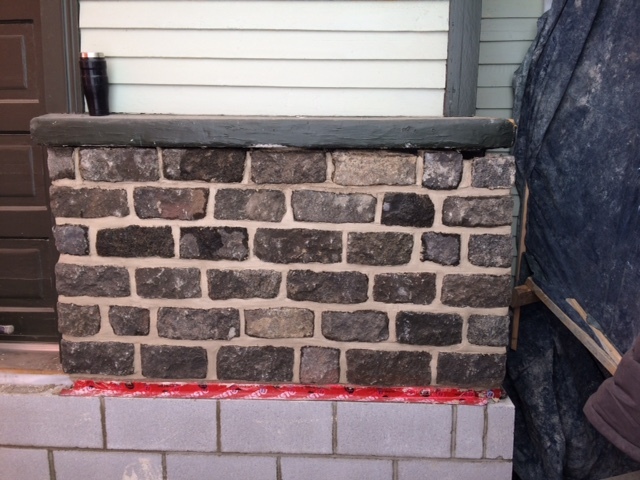 Christmas came early to the Station, as the masons from Thorstone — including Joel Thorstone and his staff — Colin, Mark and Mitchell — have now completed the work of re-installing the Whinstone facade across the front of the Station. 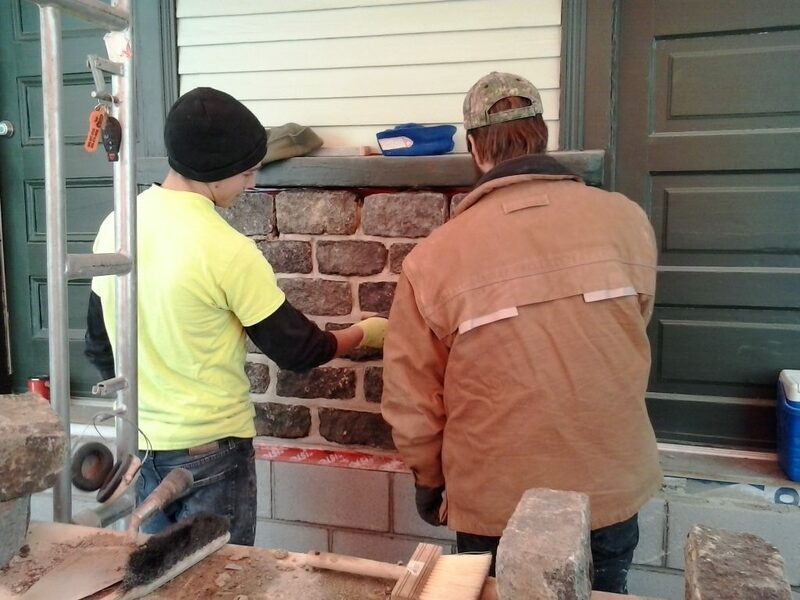 Work proceeded notwithstanding the cold weather and they finished in five days. Beautiful job, guys. 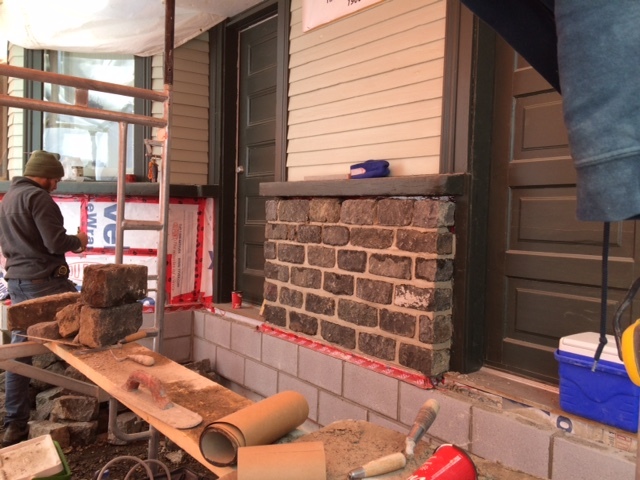 We are thrilled to see the result! 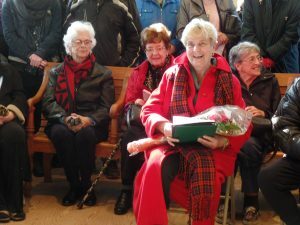 Leslie Dawe and her Mother arrived at the Burlington Junction Station from England by ship and train in 1956. 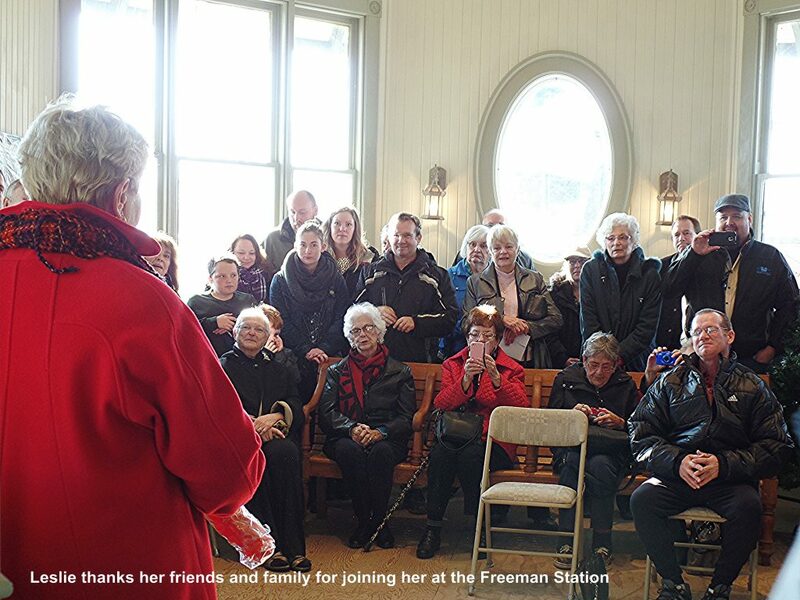 To celebrate the 60th anniversary of that occasion, Leslie invited 35 of her closest friends and relatives to meet her at the Freeman Station. The rest, they say, is history. 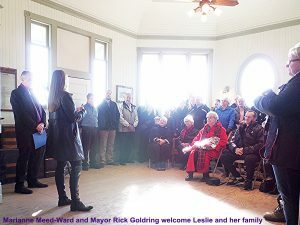 She was greeted this time by the Mayor of Burlington, Rick Goldring, and Ward 2 Councillor Marianne Meed-Ward. Greetings were also read from Hon. Karina Gould, Member of Parliament for Burlington, and Hon. Eleanor McMahon, MPP for Burlington. Well, Leslie, we couldn’t quite replicate that day’s weather for you, but we did pretty good: temperature around 45 degrees F and partly sunny, so really a nice day. So congratulations and thank you for thinking of Burlington Junction Station as the venue for your 60th commemoration! P.S. If you, dear reader, or someone you know would like to come past the Freeman Station on your nostalgic occasion, we’ll be happy to accommodate you. 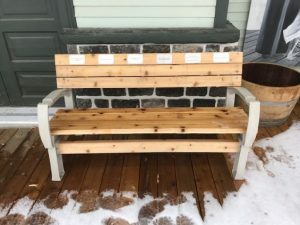 Just send us a note to info@freemanstation.ca and we’ll arrange it.